His name is legend; at least in the Jewish community of Uruguay, and over the last few decades further afield. His behavior did not fall in the normal patterns of men by any account. He lived in a state of constant paranoia and that is perhaps the source of his unusual eccentricities. No one knew his full or even real name. No one knew where he lived. He had no friends. No family. But there was one attribute that raised him above the level of a mere mortal. There was one faculty that made him more than human, despite being apparently dysfunctional in so many other areas of life. His intellect. His sheer mental power, empirical brilliance, deductive originality and mastery of human knowledge made him an intellectual force of nature that is felt in academic, philosophical, theological and religious circles to this day, despite his active lifelong crusade for anonymity. There is a tale told about his escape from Nazi Europe. When stopped by Nazi soldiers, he exclaimed that he was a Moslem Imam and how dare they stop his holy personage. They brought a local Moslem to test the veracity of his statement. Chouchani went on to quote entire sections of the Koran by heart. The local Moslem bowed in front of the clearly knowledgeable sage proclaiming that Chouchani must be one of the great masters of the Islamic religion. The Nazi soldiers, dumbfounded, let Chouchani go. Chouchani seems to have possessed a photographic memory that he used to acquire encyclopedic knowledge. Montevideo old-timers who were tutored by Chouchani tell strange stories of his familiarity with almost every subject known to mankind as well as his unusual interpersonal behavior. He apparently gave little importance to his personal appearance, clothing or hygiene. He was known to spit at students who disappointed him in some imperceptible way. He would give strange orders to some of his disciples that were followed blindly without his giving any rhyme or reason. In the relative safety of post-WWII Uruguay, Chouchani never let his guard down. His true origins and identity remained a mystery throughout his life and after his death. Only now, almost fifty years after his burial in the Jewish cemetery outside of Montevideo, Uruguay, are some hints starting to emerge. Perhaps thanks to the connectivity of the internet it is getting easier to piece together the few fragments we can ascertain about his life. There are articles about his impact on Elie Weisel and Emmanuel Levinas. There is a theory that he is one of the “lost” disciples of the revered Rabbi Abraham Isaac Hacohen Kook, the first Ashkenazi Chief Rabbi of Mandate Palestine. His true name may have been Hillel Pearlman, but still there is much more that we don’t know about Chouchani than we do. The interest however is growing. There are plans to make a movie of the elusive scholar. There are a growing number of pilgrimages to his grave. There are more discussions with those who knew him, who interacted with this phenomenon of a man. I myself am receiving more questions about Chouchani and in turn am speaking to more people who knew him. So what does the local Rabbinate do about this international interest? We are going to organize a conference. 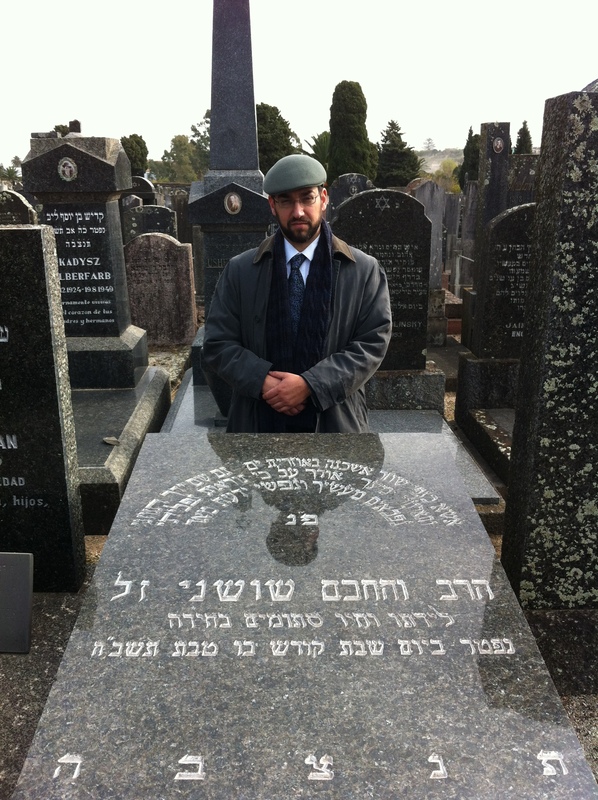 We are going to facilitate visits to his gravesite and to the Jewish establishments he frequented to get a better sense of the man, his surroundings, his environment – some clues as to his life. We are going to touch on some of the subjects he taught. We will try to gather the fragments of unique Torah lessons that his students remember, and compile a book with the wisps of insight we might capture. We will try to take note of this giant who lived amongst us who tried so hard to avoid notice. Even from beyond the grave, though he never penned a word, we will try to salvage the gems he scattered about. There is a modern story I heard of an Israeli Rabbi that was considering coming for a few years to work in Montevideo. He consulted with one of the leading Rabbis of our generation whether he should leave Israel for such a mission. The leading Rabbi was dismissive of the question, stating there is plenty of work to do in Israel. But then, before the younger Rabbi was about to leave the room, the older Rabbi asked where the younger one had thought to go. He said Uruguay. any follow up on this great man? There are various efforts at researching his life and background further. I’m not up-to-date on the latest. Thanks for the reply. Would you know if any of his teachings have been printed anywhere? I haven’t seen anything printed in his name.